It’s easy to fall head over heels for Telluride’s pristine Victorian homes and stunningly beautiful box canyon. But jaw-dropping views are just the beginning of what this outdoors and culture hot spot has to offer. Millennia after the Ute Indians settled in the craggy San Juan mountains, prospectors struck gold and silver in present-day Telluride. By 1896, the town had 10,000 residents and its very own hospital — now the beautifully renovated Telluride Historical Museum. Start here for an overview of Telluride’s evolution from gritty mining town to 1970s hippie haven to ski mecca. Then choose from one of the museum’s five walking guides, and mosey the tree-shaded streets to vintage Victorians and brownstones. Twelve blocks along the town’s main street, Colorado Ave., comprise a National Historic Landmark District and include highlights such as the Old Town Jail, the Rio Grande Southern Railway Depot and the Appaloosa Trading Company (the site where notorious outlaw Butch Cassidy robbed his first bank in 1889). 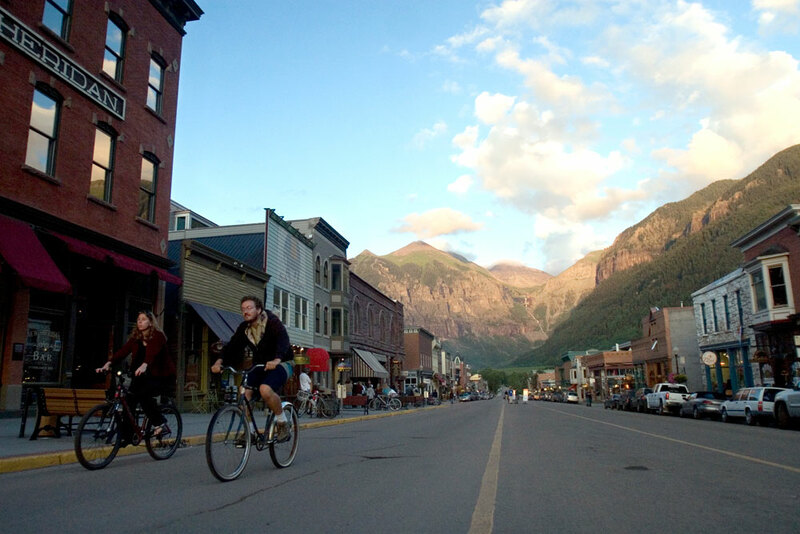 Telluride can truly celebrate its uniqueness, where all shops, restaurants and hotels are independently owned and Colorado minded — something that surely contributes to its designation as a Certified Colorado Creative District. And there’s no need for a car in Telluride — between the gondola and Galloping Goose bus in town, getting around is a (free) snap! Pop into the new Visitors Center across the street for guidance on exploring the area. Heading east, pick up the serene and well-maintained River Trail, which turns into the Idarado Legacy Trail at the town park. In the summer, the park bustles with music and cultural festivals. From here, take the easy two-and-a-half-mile path, lined with placards about the gold under your feet, until you reach the base of Bridal Veil Falls — Colorado’s highest free-falling waterfall. Intrepid hikers can climb the switchbacks to the top of the 365-foot falls for access to additional trails in the Bridal Veil Creek Basin. Or get a bird’s-eye view of the densely forested San Miguel River Valley during a ride on the gondola, which leaves from downtown. The free, 13-minute journey carries you over the San Sophia Ridge to the Mountain Village. This newer and totally separate town is a jumping-off point for more hikes, mountain-bike trails and rock climbing. Or just relax on the patio at one of the plethora of restaurants. If it’s a Wednesday, stay into the evening to enjoy free music on the main plaza. You’ll also find the Telluride Adventure Center, with activities for kids that include a ropes course, Water Walkers Course, bungee tramp and more. Back downtown, the Sheridan Opera House is the perfect place to take in a rock concert or ski film. Built during the gold-rush heyday, the small, ornate theater was designed to be colorful and airy — a welcome change for men who spent their days underground. Still have steam left? Go gallery to gallery on the Telluride Art Walk. Local art shops stay open late and offer free refreshments on the first Thursday of every month except May, November and December. Pay a visit to Montrose by heading north to U.S. Hwy. 550 and driving through Ridgway (also a Certified Colorado Creative District). Make a short detour to Orvis Hot Springs, where you can soak in the clothing-optional mineral pools while taking in dramatic views of Mt. Sneffels. Continue on the scenic route to Montrose, an ideal basecamp for exploring the Black Canyon of the Gunnison National Park and the Curecanti National Recreation Area, home to the impossibly sparkly Blue Mesa Reservoir. Continue to Montrose for some antique shopping, or head to Montrose Water Sports Park for rafting, kayaking and tubing on the Uncompahgre River. Drive time is about an hour and a half one way from Telluride. North of Montrose, the towns of Cedaredge, Crawford, Delta, Hotchkiss, Orchard City and Paonia are a growing organic-food and wine region with winery and farm tours, wine tastings and farm dinners. Paonia, Hotchkiss and Crawford are a Certified Colorado Creative District, where artists’ studios, musicians, writers and other creative folk mix among the mesas. For active diversions, Sweitzer Lake State Park near Delta is a relaxing place for boating and birdwatching. Gunnison Gorge National Conservation Area is popular with hikers, backpackers and tout fishers on Gold Medal Waters; the area’s Sidewinder Trail is a challenging new singletrack luring serious mountain bikers to the area.